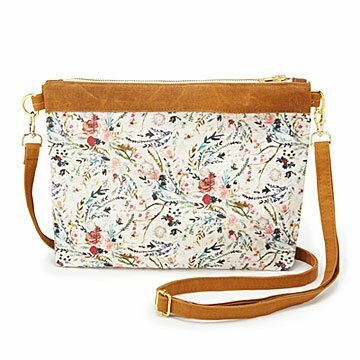 This pretty floral print bag, hand-waxed with a custom beeswax blend, is tough enough to take a beating. While you're admiring the pretty botanical pattern that graces this crossbody bag, consider a practical note from makers Leah and Cody Seelye: "Our bags can withstand a beating." Handmade from waxed cotton canvas, they're tough and water and stain resistant—not to mention beautiful. Leah and Cody prepare their own canvas using a beeswax blend they custom formulated. Great for holding small essentials when shopping or out for the evening, the zippered pouch features a waxed canvas wrist strap with lobster clasp. Handmade in Michigan. "In this age of 'digital,' I feel that we are craving something to hold, to feel, and something to connect with," says Wisconsin-born bag maker Leah Seelye. Growing up, her parents worked hard to instill in her an understanding of the value of handmade. Together with her husband Cody, Leah is passionate about hand-making products and sharing them with others. She genuinely believes that buying local and buying handmade is vital to building a community that helps each other. Leah and Cody started creating their clutches and bags for those who love waxed canvas but want a wider variety of prints and styles. They're inspired by Southwestern prints and Scandinavian and American folk patterns and colors. Cody waxes all the canvas in their home studio. Learning to wax canvas with their own custom blend was an important part of their process. When not waxing canvas or turning it into bags, they love biking, photography, crafting, and caffeinating. Wipe with damp cloth. In case of stains, please wash on cold cycle with very mild detergent. Outer shell can be re-waxed with a wax bar seasonally for a longer life. Cait will love the size of this bag and will so appreciate the craftsmanship behind it.